Raptivity - Rapid Interactivity Building Tool: Raptivity takes care of your budget blues with Annual Licensing! With the annual licensing model, Raptivity allows you to deliver high quality interactive learning experience to your learners while also staying within your budget. Raptivity annual license, as the name suggests, is a license that is valid for one year, with the option to renew at the end of the year. 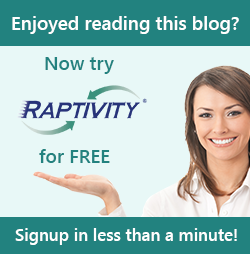 The Raptivity license still continues to be a desktop license. This pricing option is an attractive option for those eLearning developers who wish to purchase Raptivity, but would rather pay annually from their recurring budget than purchasing the perpetual license by paying full cost upfront. Access to Raptivity Himalaya – Users availing annual licensing option get access to Raptivity Himalaya which is the complete library of Raptivity interactions, along with all new interactions which are added regularly to Raptivity Evolve. Raptivity premium support – With the annual license, you gain access to 22x5 Raptivity premium support, enabling you to get queries addressed on priority. Access to premium customer portal – Annual licensing entitles you to gain access to premium customer portal which allows for easy download, license details and live chat with Raptivity Support team. Free upgrades and easy re-assignment – You will be entitled to free upgrades for the complete duration of your license. You will have the provision to re-assign your Raptivity license to another user for the remaining license duration. Exclusive RVP access and Expert Hour Sessions – With the annual license, you get exclusive access to Raptivity Valued Professionals (RVPs) for quick tips, tricks or to get answers to your questions. You can also avail up to two exclusive Raptivity expert hour sessions during the first 12 months of your license duration. You will get the opportunity to discuss your specific interactivity needs with RVPs and learn how to use Raptivity to its fullest potential. Conversion to perpetual license – You have the provision to convert your annual license to a perpetual license at any time. To know more about the annual licensing option, click here. With so many benefits to offer, Raptivity’s annual license is surely not something to be missed. If you have any queries or comments about the annual licensing option, do write to us at info@raptivity.com or share through comments below.